All in a (long) day's work! BAGHDAD – Here begins a story about how some New Jersey Airmen beat equipment woes, horrific weather and a seemingly impossible deadline to complete a mission in a war zone half a world away. It all started on May 7 when word came down that the New Jersey Air National Guard's 447th Civil Engineer (CE) Squadron needed to move an aging trailer through the maze-like terrain on the grounds of Baghdad International Airport. They had 48 hours to complete the job. The team leapt into action. The structures shop worked into the night to prep the trailer for the move. The engineering assistants planned and marked roads as well as access and security points for the new location. At 'o'darkthirty,' the task force hit the trail, grading a road and moving a crane to hoist the trailer onto a flat bed truck. The morning turned to afternoon and the temperature climbed into the low 100's. Crews went to work with graders, a bulldozer and front loaders to smooth the route and a crane was moved in place to lift the trailer. Then came the first snag: the trailer was far heavier and could not be safely moved. It would have taken several days to acquire a larger crane. But the team didn't have days. Staff Sgt. Anne McKenzie, Electrician, installs an overhead light fixture in the new Gryphon Air facility. 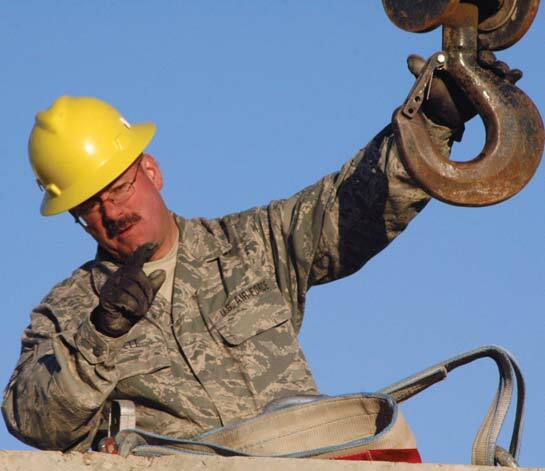 Heavy Equipment Supervisor Master Sgt. Patrick Basnett directs the placement of a "T-wall" barrier in place. In the can-do spirit of their New Jersey roots, Capt. Eric Balint and Chief Master Sgt. Tim Grover started working up an alternate plan. With the help of Master Sgt.Pat Basnett, the team convinced an Army unit to give up a different trailer. While some team members went to secure the new trailer, the rest of the crew began prepping the site. That night, fueled by the heat of the day, the worst rain storm of the year struck undoing all the prep work at the site. Immediately part of the team began redoing the prep work; the rest set about moving the new trailer. Master Sgt. John Krzewski oversaw the move but the team still had much to do and the clock was ticking. 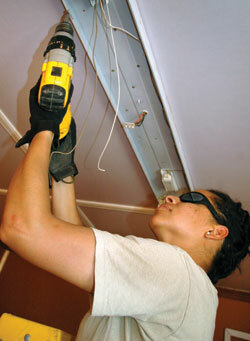 Electricians went to work not just connecting, but upgrading the equipment in the trailer; HVAC put new units in place and wired them up, while Structures performed a quick rehab of the interior. The 14-hour ballet dragged into the night. The troops used every available form of illumination, including vehicle headlights to complete the job. By the time Security Forces had placed the concertina wire, 57 CE members had sacrificed their down-day, constructing 1.5 linear miles of road, moving and placing 300 concrete barriers, fabricating and installing a security gate, moving furniture from the original office into the new one, and finally setting up and installing phones and computer systems -- making the trailer operational for its occupants the following morning.